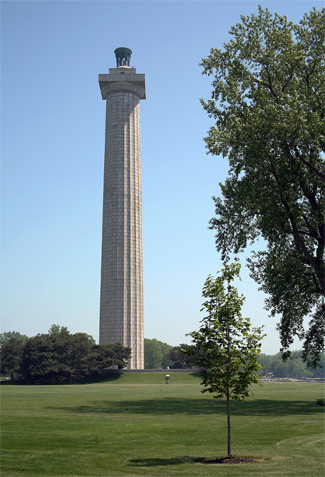 The Perry Memorial Monument may look like one of the many lighthouses that decorate the shores of the Great Lakes, but its origin is rooted more in direct warfare than the battles with the elements that mariners normally faced. Standing tall and serene on an isthmus of South Bass Island, the Perry Memorial has a complicated history that intersects several of the wars that beset the nation during the many years it took to plan and erect the monument. “We have met the enemy and they are ours….”, so began Commodore Oliver Hazard Perry’s report on his famous victory during the War of 1812. Although Perry’s fame came from his daring victory on Lake Erie, he was born and reared in South Kingston, Rhode Island, on August 23, 1785. The first child of Christopher Raymond Perry, himself a U.S. Navy man, a thirteen-year-old Oliver joined the Navy as a midshipman under the command of his father. Over the next few years, he sailed throughout Europe and Africa, participating in the Barbary Wars. By his twentieth birthday, he had been made a lieutenant and had been given command of a small schooner that cruised the northern and mid-Atlantic. In 1808, at the request of President Thomas Jefferson, Perry returned to Rhode Island and Connecticut to supervise the construction of a flotilla of small gunboats. Although this experience proved useful later, Perry considered it tedious and yearned for more “active” duty. His wish was granted in 1809, when he was given command of the fourteen-gun schooner Revenge. Two years later, his tenure on the Revenge ended when it wrecked on a reef off the coast of New England during heavy fog. The ensuing court-martial found the pilot to blame, not Perry, and even congratulated Perry on his valiant attempts to salvage the boat. After this incident, Perry took an extended leave of absence and married Elizabeth Mason, whom he had met at a dance several years earlier. By 1812, trouble was brewing with Great Britain, and, eager to be involved if war broke out, Perry sought employment again. In June, the United States declared war on Great Britain. Perry was initially given command of a squadron of gunboats at Newport, Rhode Island. Although pleased with his promotion to master-commandant, Perry longed to be more involved in the conflict, and, as no assignment on the high seas was forthcoming, he petitioned for a position on the Great Lakes. This proved to be the making of the naval hero. He reported to Commodore Isaac Chauncey at Lake Ontario on March 3, who assigned Perry to oversee the construction of a fleet whose mission would be to seize control of Lake Erie from the British. On September 10, armed with nine ships, Perry blockaded the British fleet at the western end of the lake. At first, the British had the advantage, with Perry’s flagship, the Lawrence, taking most of the fire. With his ship severely damaged and most of his crew killed or wounded, Perry took the ship’s flag emblazoned with “Don’t Give Up the Ship,” hopped in a small boat, and transferred to the Niagara, which had sustained less damage. Undaunted by the dire situation, Perry sailed the Niagara into the British battle line, and soon forced the British to surrender. The success on Lake Erie provided the United States with a crucial bargaining chip in its peace negotiations in Ghent, Belgium. Possibly as important, it provided the country with hope that it could eventually prevail against Great Britain. For the optimism that Perry’s courage inspired as much for the strategic importance of Lake Erie, Perry’s victory won a place in the nation’s heart. For decades after the war, various movements attempted to organize some sort of a memorial to Oliver Hazard Perry, but none generated enough money to actually begin construction, even though enthusiasm for the idea ran high. Every year, thousands of celebrants gathered to commemorate the Battle of Lake Erie, and eventually funds were raised for a memorial. In 1859, over 15,000 people were on hand to watch the laying of the cornerstone for the planned monument. However, construction didn’t move forward quickly enough, and soon the Civil War broke out and diverted all attention from past wars. Reigniting enough public interest to get a monument built after the Civil War proved difficult. Wounds were deep and money was tight, and the glories of the distant past couldn’t overshadow the current griefs. Although the Perry Monumental Association was formed in 1867, it failed to raise sufficient funds, and the hoped-for project never materialized. Interest in a Perry Memorial slowly returned, and by 1903 eleven separate bills had been introduced to Congress for jump-starting the project. However, it wasn’t until 1908, when the Ohio General Assembly passed a resolution for a centennial celebration of Perry’s great victory, that the undertaking gained real momentum. Instrumental in generating and maintaining support was Webster P. Huntington, of the Huntington Nation Bank family, who used his influence as a newspaper editor to keep public focus on the memorial. When the Ohio General Assembly was presented with a $10,000 appropriation bill for the memorial, Huntington was on the spot lobbying for passage and enlisting allies to the cause. 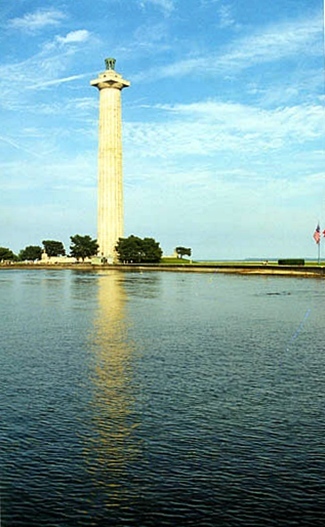 One of his recruits that day was John Eisenmann, who captured in a watercolor his vision of a monument built on the isthmus connecting the two larger sections of South Bass Island. Armed with Eisenmann’s watercolor, the Ohio Commission approached other states for financial support. Eight of these states — Pennsylvania, New York, Michigan, Illinois, Wisconsin, Kentucky, Massachusetts, and, naturally, Rhode Island — pledged support and formed the Inter-State Board of the Perry’s Victory Centennial Commission. Regrettably, their combined funds fell rather short of the projected cost, so the Inter-State Board turned to the federal government. With the lobbying of many prominent individuals, the government agreed to appropriate $250,000 for the monument. Of course, as sometimes happens with government grants, there were strings attached. President Taft saw this as a prime opportunity for the newly formed U.S. Fine Arts Commission to see some action, so he stipulated that the design for the Perry Memorial should be selected by a public competition, overseen by the Commission. Fifty-four designs were submitted by a total of eighty-two architects hailing from nineteen cities. On January 25, 1912, the judging took place at Washington, D.C. in the prestigious Willard Hotel. John Eisenmann’s original design was passed over in favor of the design of architects Joseph H. Freelander and Alexander D. Seymour, Jr., of New York City. However, Eisenmann was awarded a $1,500 consolation prize, and his idea of the isthmus on South Bass Island was regarded as the ideal site for the memorial. Procuring the land, owned by six different people, was the next difficulty, but in time $15,000 bought the fourteen acres necessary for the project. By June 1912, the building committee had accepted a contracting bid for $329,851 (later raised to $357,588) from John C. Robinson & Sons of New York City and Chicago. The committee also had to hire a separate, local contractor to clear the construction site, which, unfortunately, turned out to be a wooded swamp. By the fall of 1914, construction of the 352-foot high column was well under way. Huge casings were sunk for the concrete piles. By January 1915, the concrete upper plaza and stairway risers were poured, with the lower plaza soon following. By the time the granite parapet walls, steps, and stones that edged the lower plaza were in place, funding ran out. Instead of paving the plazas, the builders covered them with less-expensive gravel. 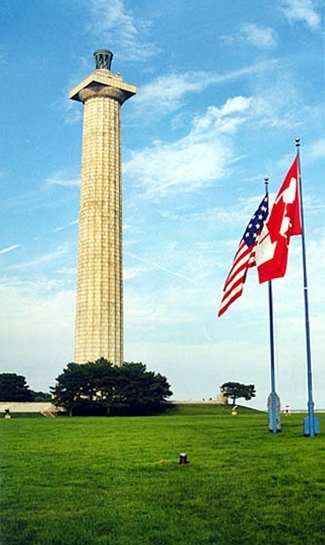 On June 13, 1915, the Perry Memorial Monument opened to the public. 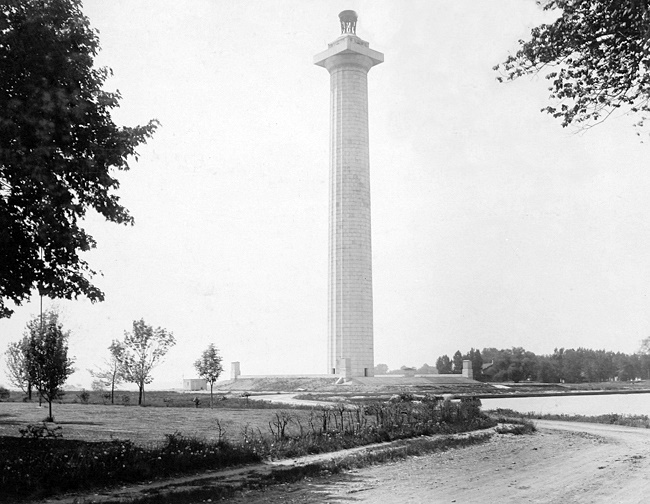 The gleaming column, comprising 2,340 granite stones, finally stood sentinel over the lake, which was Perry’s triumph more than 100 years before. The opening was overshadowed by events in Europe: trenches were being dug across the Western front, the Germans had begun using chlorine gas, and the United States was outraged by the recent sinking of the Lusitania. Once again, the memorial to a past victory seemed to be lost in present unrest. The saga of the Perry Memorial Monument was almost at an end, but not quite. An act of Congress federalized the Inter-State Board of the Perry’s Victory Centennial Commission in March of 1919. The re-named Perry’s Victory Memorial Commission now had an easier time acquiring federal funds, and almost immediately received $20,000 for landscaping. A further $100,000 was allocated in 1924 for protective seawalls, more landscaping, and sandstone for the plazas. In 1928, a $14,000 appropriation purchased floodlights, and on July 31, 1931, the now fully-complete Perry’s Victory Memorial was officially dedicated. Although all improvements had been completed, the nature of the memorial itself had a couple of changes left in store. On June 2, 1936, President Franklin D. Roosevelt declared the memorial a national monument “for the preservation of the historical associations connected therewith, to inculcate the lessons of international peace by arbitration and disarmament, and for the benefit and enjoyment of the people.” And the final touch came the next month, on July 6, 1936, when a presidential proclamation included the now-named “Perry’s Victory and International Peace Memorial” as part of the United States National Park Service. Ironically, this occurred when international peace was at a premium—civil war had broken out in Spain and three months earlier Hitler had sent German troops into the Rhineland. Certainly the Perry Memorial stands as a fitting tribute to the hero whose daring determination marked a turning point in the war that both ended Britain’s hope for reclaiming American colonies and put the United States on the international map. But the memorial that was envisioned as a monument to one man’s extraordinary courage perhaps serves, even more fittingly, as a poignant reminder of the sacrifice that is necessary in all eras to win and maintain peace. 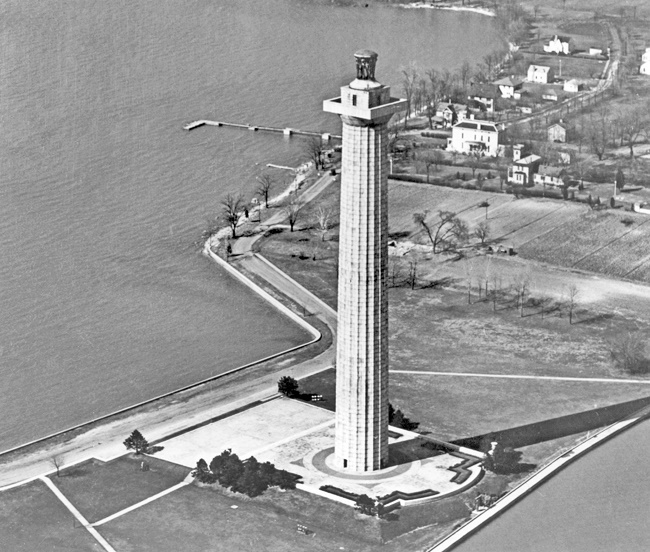 The addition of two marine-type lights to the illuminating equipment of the National Monument at Put In Bay, Ohio, will make this unusually high structure of greater use as a navigational aid to the large fleet of commercial and pleasure craft which navigate the waters of Lake Erie. 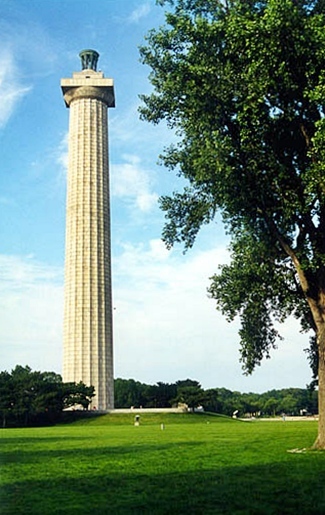 The Put In Bay monument, primarily a memorial to Perry's victory on Lake Erie, and commemorating international peace, because it rises 352 feet above the lake, has long been used as a landmark by mariners. The decorative lighting, suitable to the primary purpose of the monument, however, has not fully served the needs of vessel traffic. The Coast Guard's decision to provide electric navigational lights will increase the value of the monument to shipping and boating interests. Located in Put-In-Bay on South Bass Island. 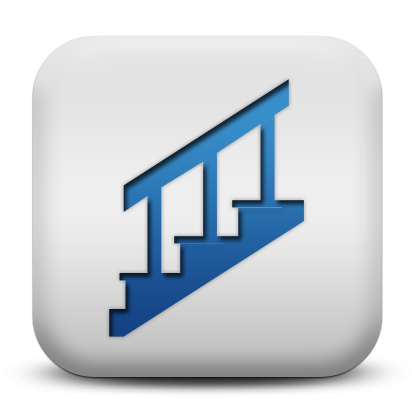 For a larger map of Perry Memorial Lighthouse, click the lighthouse in the above map. 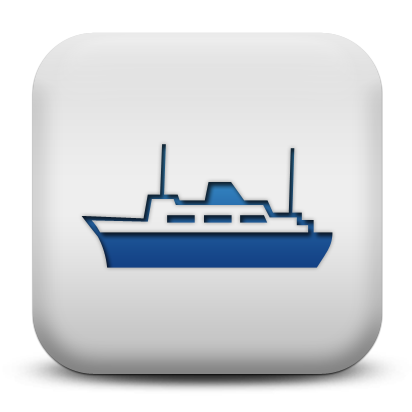 South Bass Island can be reached by ferries from Sandusky, Catawba, or Port Clinton. A great way to view the island is by golf cart or bicycle, both of which can be rented at either ferry landing. 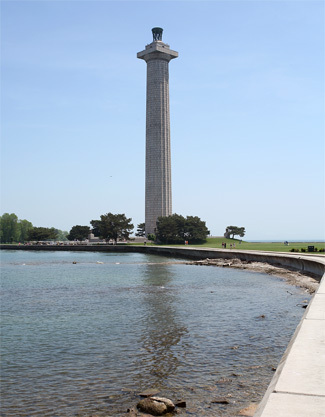 Perry's Victory and International Peace Memorial is located near the Put-in-Bay ferry landing, and 2.3 miles from the ferry landing at the south end of South Bass Island. 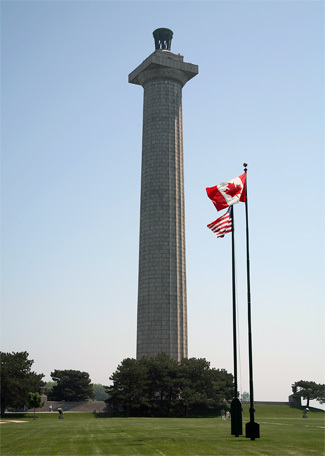 Perry's Victory and International Peace Memorial is open daily from mid-May through the first of October. The monument is owned by the National Park Service. Grounds open, tower open in season.